The teen labor force participation rate declined sharply in recent years, a development that directly impacted the restaurant workforce. 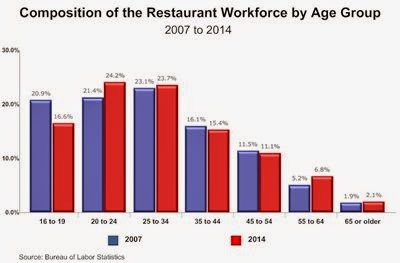 Although restaurants are still the economy’s largest employer of teenagers, the shrinking teen labor pool has led many restaurant operators to look to alternative age cohorts to fill their staffing needs, according to the NRA’s chief economist Bruce Grindy. His Economist’s Notebook commentary and analysis appears regularly on Restaurant.org and Restaurant TrendMapper. Is E-Verify expansion on the horizon?